MINKANAK GOOGLE CARDBOARD BRING YOU THE MOST IMMERSIVE VIRTUAL REALITY EXPERIENCE! 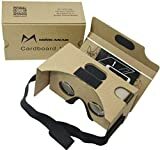 MINKANAK Google Cardboard kit is a revolutionary product to transform the way you interact with your smart phone, through this MINKANAK Google Cardboard set you will contact the latest VR technology and get great engrossing , impressive virtual reality cinematic experiences. As you may find, the MINKANAK VR kit is the #1 Top-Rated Google Cardboard with the most complete accessories! MINKANAK Virtual Reality Set has all those accessories you have ever seen or have never seen on Amazon. After comparision with other sellers, you will find only MINKANAK can give you the best virtual reality experience. Package List 1*MINKANAK Virtual Reality Viewer (Google Cardboard ) 1*Rubber Band for Fixing Phone 1*Black Soft Head Strap 1*NFC tag 1*MINKANAK Google Cardboard V1.0 Kit Manual 1*Nose Pad 1*Forehead Pad 1*Magnet clicker Don't let a lousy Cardboard ruin your first VR experience! Enjoy virtual reality only with THE BEST! Unlike other cheaper alternatives, MINKANAK VR kit take imported cardboard and lens of highest quality.The precise machine cut, clearly numbered parts, well printed instruction with QR code allow you to assemble the glasses within minutes and minimal hassle. All in all, MINKANAK will give you the best! If you are unsure that your smart phones compatibility with Google Cardboard apps, please never hesitate to contact us on Amazon. NO.1 TOP-RATED GOOGLE CARDBOARD ON AMAZON! MINKANAK Virtual Reality Viewer V2.0 Kit give you best quality, most complete accessories, and more immersive experiences! Do you love the latest technology and want to enjoy more engrossing cinematic experiences but never go to the 3D cinema because of the high price? Do you find though your Google Cardboard V1.0 gave you some fun but now is not suited to your new smartphone with bigger screen? Do you find your Google Cardboard V1.0 is not so comfortable after long time wearing due to limited view and lack of head band? Now, MINKANAK Reality Viewer V2.0 Kit with several refine improvements will give you more comfortable and more immersive viewing experience. MINKANAK Virtual Reality Viewer V2.0 3D VR Glasses is specially designed for smart phones and can add great effect to the movie-going experience. It can be regarded as your private 3D Cinema and bring you great game experience. And, It is easy to be used by people, even the youngest children or the old, you just need to put your cell phone into the relative slot of the item. And then, you can greatly enjoy the 3D movies or VR games. It is perfectly suitable for students, white-collar worker or travelers, etc. Package List 1*MINKANAK Virtual Reality Viewer V2.0(Google Cardboard V2.0) 1*Rubber Band for Fixing Phone 1*Black Soft Head Strap 1*NFC tag 1*MINKANAK Google Cardboard V2.0 Kit Manual 1*Nose Pad 1*Forehead Pad This MINKANAK Google Cardboard set is perfectly compatible with all the smart phones on market. Never let a terrible google cardboard ruin your first virtual realiy experience. Please never hesitate, click the buy button and own the best google cardboard right now! If you have any question for our product, please contact us to get prompt reply. NO.1 SALE GOOGLE CARDBOARD VERSION 2 ON AMAZON! In the past 9 month, we have sold tens of thousands of google cardboard version 2 products, thanks for all MINKANAK fans' support, thanks for still choosing our products when we are suffering mass of negative reviews attack from vicious competitors. Our products are not perfect, but are definitely the best ones on Amazon, and we are always being on the way to perfection! we are keeping improving our products every 2 weeks. If you are not satisfied with the product you received, tell us, we will refund to you fully right away and will send you free sample of our improved products of next generation to you for 100% satisfaction. 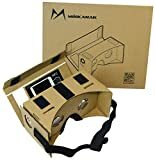 MINKANAK Virtual Reality Viewer V2.0 Kit give you best quality, most complete accessories, and more immersive experiences! Do you love the latest technology and want to enjoy more engrossing cinematic experiences but never go to the 3D cinema because of the high price? Do you find though your Google Cardboard V1.0 gave you some fun but now is not suited to your new smartphone with bigger screen? Do you find your Google Cardboard V1.0 is not so comfortable after long time wearing due to limited view and lack of head strap? Now, MINKANAK Reality Viewer V2.0 Kit with several improvements will give you more comfortable and more immersive viewing experience. Package List 1*MINKANAK Virtual Reality Viewer V2.0(Google Cardboard V2.0) 1*Rubber Band for Fixing Phone 1*Black Soft Head Strap 1*NFC tag 1*MINKANAK Google Cardboard V2.0 Kit Manual 1*Nose Pad 1*Forehead Pad This MINKANAK Google Cardboard set is perfectly compatible with all the smart phones on market. If you have any question for our product, please contact us to get prompt reply.